Fixed two players mode not working. Thanks for playing Fantastic Checkers!!! Fantastic Checkers is a great version of this traditional board game. It has beautiful graphics, nice background music and a nicely tuned AI with multiple levels of play for fun at any level. There is also a two player mode so you can play against a friend. 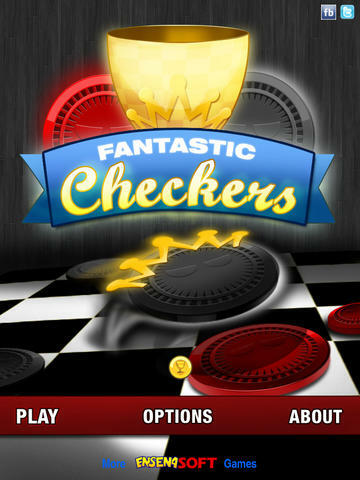 If you are a fan of checkers (draughts) you will love this game. OpenFeint is integrated for achievements and online multiplayer. Play up to 8 games at once with quick match or against friends. You can also play multiplayer head-to-head games using Bump! Just bump your devices together and play. Requires Internet connection (3G, EDGE, WIFI). Each player can use the theme they want. The game starts on an 8x8 board with 12 pieces on each side. These pieces may only initially move and capture diagonally forwards. Only when a piece is "crowned" or "kinged" may it move both backwards or forwards. The opponent's pieces are captured by jumping over them. A player wins by capturing all of the opposing player's pieces, or by leaving the opposing player with no legal moves. Christmas theme allows you to play with yummy Christmas cookies! - OpenFeint is integrated for achievements and online multiplayer. Play up to 8 games at once with quick match or against friends. - Fun AI with 3 levels (beginner, medium and expert). - Option to disable Force Jumps. - 2 great themes (Classic Checkers and Christmas Cookies). Thanks for buying Fantastic Checkers!